Fashion month is here and as much as we love the main event, the catwalk shows, there is no denying that in recent years, the street style surrounding the shows is seeing increasing hype. Naturally, the shows attract some of the most stylish celebs and fashionable females in the industry, and we can’t help monitoring the street style round ups for some current fashion inspo. So now that we’ve seen what LFW had to offer, I’ve rounded up some of my favourite street style looks from the capital city. This outfit is giving me major geek chic vibes and I love the layering, particularly the oversized sleeves of the lime green knit. 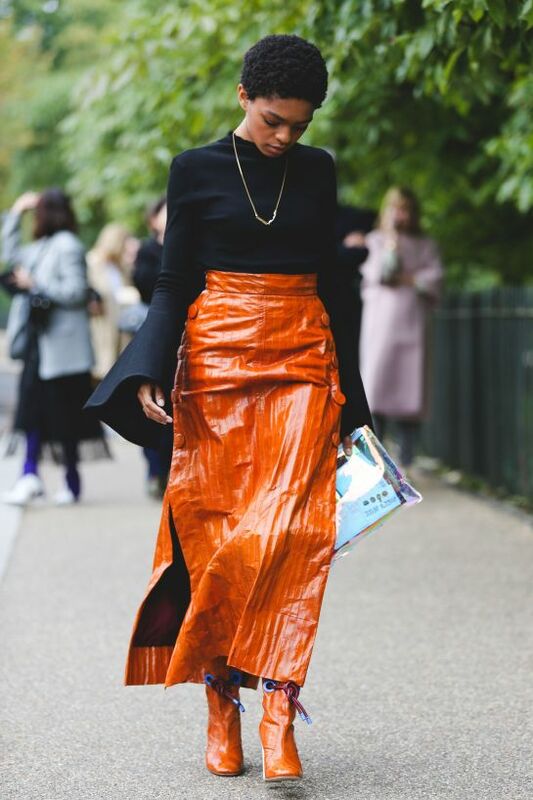 So, clearly I have a thing for statement sleeves, as I also love Selah Marley’s style en route to the Roksanda show. Bright skirts teamed with chic sweaters is one of my favourite autumn looks. I like this look because it feels so playful! So many serious street style faces, but Caroline Daur is a ray of sunshine in stripes and colour, on her way to the J.W. Anderson show. I want this skirt. I love a metallic jewel tone but am not always sure how to wear them, so I’m taking notes from this this elegant ensemble. Anna Vitiello mixed it up by pairing this feminine, printed maxi skirt with a fun slogan tee, and she looks fab! Also, extra points for the shoe shape of this season, the slouch boot. Check is having a bit of a moment and Roberta Benteler styled her trousers perfectly, with a camel sweat layered over a polo, and a pop of my favourite colour, green. Whose fashion week street style have you been admiring? We can’t wait to see what looks emerge from the Milan and Paris shows!